From Seller: Less then 250 hours. The EverFlo Q Respironics Oxygen Concentrator is Stationary, Compact at 31 lbs. and Low Maintenance! The Respironics EverFlo Oxygen Concentrator is a 5 liter per minute stationary oxygen concentrator. 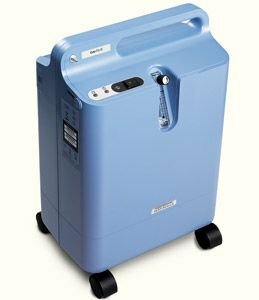 Until now, oxygen concentrators have been very similar in design with heavy, bulky and noisy characteristics, frequently requiring maintenance. But the EverFlo Oxygen Concentrator from Respironics is a unique oxygen concentrator that delivers the features homecare providers want and patients deserve. The Respironics EverFlo Oxygen Concentrator has been designed with a unique set of features to lower the costs of providing oxygen therapy while maintaining ease of use. Please Click Here to See How Quiet the EverFlo Q is! The exclusive design of the Respironics oxygen concentrator allows the EverFlo to reduce operating costs. The new smaller and sleeker design of the Respironics EverFlo Oxygen Concentrator is lightweight and easy to store or transport, weighing only 31 lbs. The EverFlo Oxygen Concentrator is simple for patients to use and maintain. Respironics oxygen concentrators feature user friendly design, quiet operation and low maintenance. No filters for the patient to change! Available with and without OPI (oxygen purity indicator). The Respironics EverFlo Concentrator includes a limited 3 year warranty. This unit is fully compatible with the NEW 2010 UltraFill Home Filling Station. Sound Level: 40 dBA typical NEW! * Respironics concentrator operation above or outside of the specified voltage, LPM, temperature, humidity and/or altitude values may decrease oxygen concentration levels.